Renesas Electronics Corp. tests an autonomous vehicle in Stratford, Ont. STRATFORD, Ont. — A Canadian town known for its annual theater festival is emerging as a hub of “snowtonomous” research, as automakers face demands to produce self-driving cars that can perform in snow and sleet. Canada’s largest city, Toronto, is one of three places where Uber tests driverless technology - the other cities are Phoenix, Arizona, and Pittsburgh, Pennsylvania. Automakers, ride services companies and others are investing in self-driving technology said to reduce accidents, and the costs of a driver, with robo-taxis expected to hit the road as early as this year. A wider rollout, however, is expected to take years, if not decades, as companies work to prove autonomous vehicles can run not just in balmy U.S. states, where they are mostly tested, but in colder areas like Ontario and Michigan where snow and sleet can render cameras and sensors ineffective. Ross McKenzie, managing director of the Waterloo Centre of Automotive Research, recalled how a vehicle’s lidar, which uses laser light to help autonomous cars “see” nearby objects, once mistook an ice patch for a pothole. McKenzie’s research team at the University of Waterloo responded by tweaking the sedan’s software so it would factor in the time of year and weather when driving in the snow and ice, conditions that autonomous vehicles will have to navigate to be commercially viable. The car needs to consider “we have winter driving conditions because I’m in Canada, it’s November and it’s 15 below,” McKenzie said by phone. Ontario, which has lost automaking jobs to lower-cost Mexico in recent years, is counting on the lure of its snowy winters and the strength of its automotive and software engineering sectors to establish a “Silicon North.” Since 2016, Ontario has attracted about C$1 billion ($765 million) in private-sector investment for autonomous and connected cars. In Stratford, where the theater festival is an important employer of its 31,000 residents, the city-wide wireless network and weather are helping to attract companies researching connected driving technologies. Ubiquitous Wi-Fi gives companies the option to test vehicle-to-vehicle communication over a 4G band, McKenzie said. Japanese semiconductor manufacturer Renesas Electronics Corp. chose Ontario as the site of its only autonomous test-track because of the harsh winters, along with its proximity to Blackberry’s QNX unit which produces the operating system. 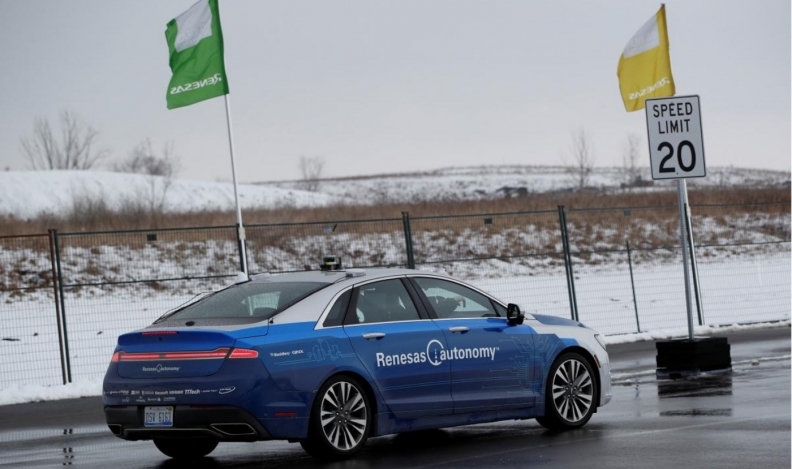 The use of high-definition maps helps self-driving vehicles more easily navigate in the snow, even when road markings are not visible, said John Buszek, Renesas’ Michigan-based director of the company’s autonomous and advanced driver-assistance division. Renesas’ Lincoln MKZ sedan, which does not currently drive autonomously on public roads, is still equipped with enough backup cameras and sensors to keep running even if one gets covered in sludge, Buszek said. “In order for the car to have enough sensors to be robust against all different types of climates it means there are going to be a lot of sensors,” he said during at a recent demonstration at the chipmaker’s track in Stratford, Ontario. While extra cameras, sensors and lidar work well on the track, consumers are less keen on the cost, appearance and inefficiency of a car covered with such lenses. Some automakers are looking at protective coatings to keep a smaller number of lenses free of sludge. “Ultimately those sensors that you would see on the car today have to be integrated into the car system,” said Justin Gammage, industry liaison manager at the University of Ontario Institute of Technology’s Automotive Centre of Excellence (ACE) in Oshawa, Ontario. Gammage, formerly General Motors Co.’s chief scientist in Canada, said researchers are still looking at non-stick coatings as a cost-effective way to protect lenses. He has yet to find a one-size-fits-all-coating. When self-driving vehicles fail to receive enough data through their cameras, sensors and lidar due to bad weather, they simply will not be able to drive autonomously, McKenzie said. The public should not expect self-driving vehicles to hit the road in conditions that humans would avoid.